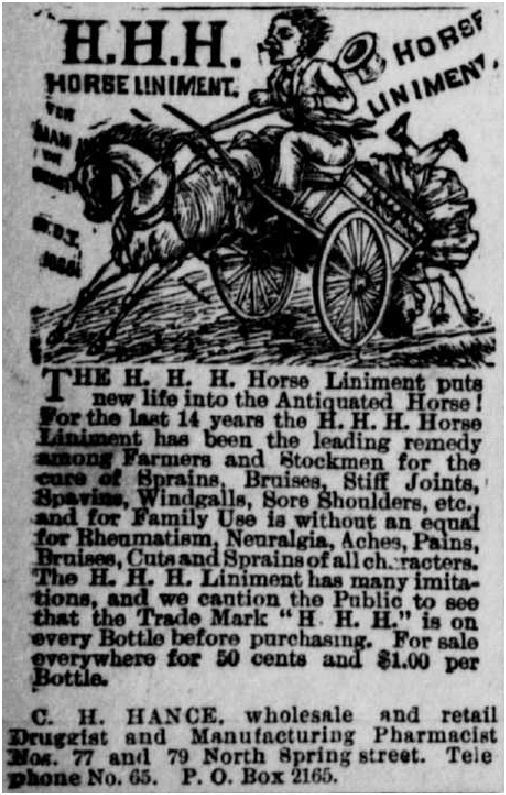 It took a while, but was able to run down quite a bit of obscure info on the Horse Liniment post. 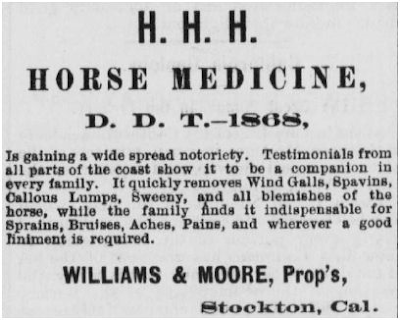 First reference I found to Williams was July 5, 1875. 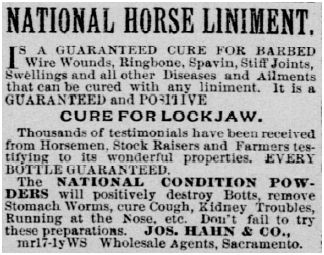 However, it was not in association with his National Horse Medicine; rather it was HHH Horse Medicine. He was partnered up with a Mr. Moore in Stockton. 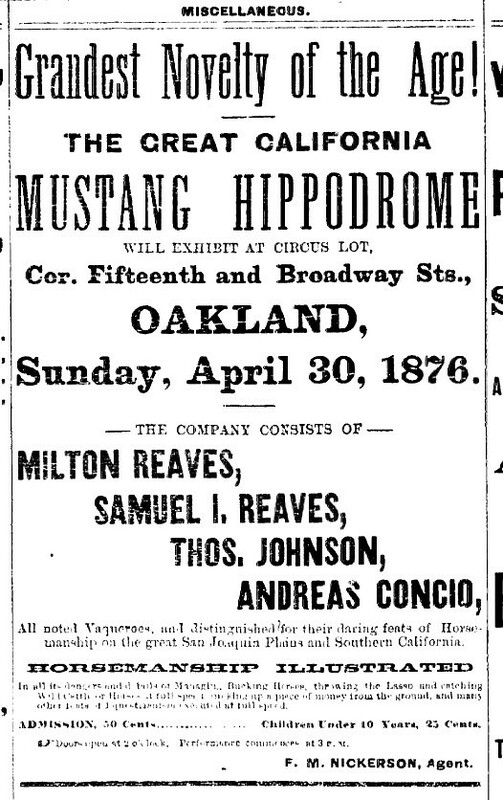 The first reference to National appeared on May 5, 1883. 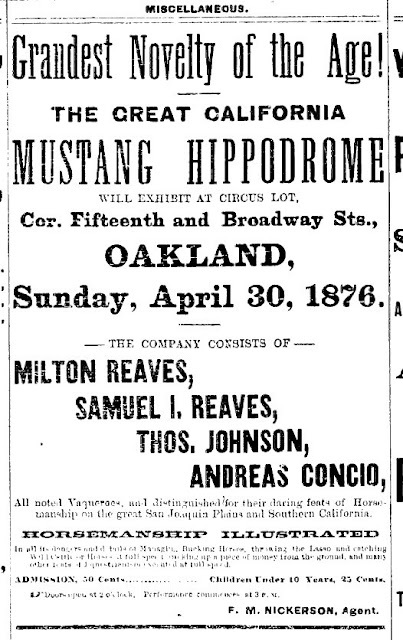 Later, a redesigned ad with fancy graphics appeared; first date was March 8,1884. 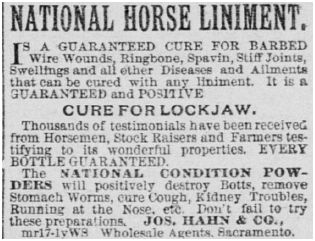 By March 16, 1886, the ad had changed and the product was now being peddled by a drug wholesaler. Meanwhile, HHH continued to be sold for several more years throughout the Central Valley and SO. Cal.. I am new to posting. 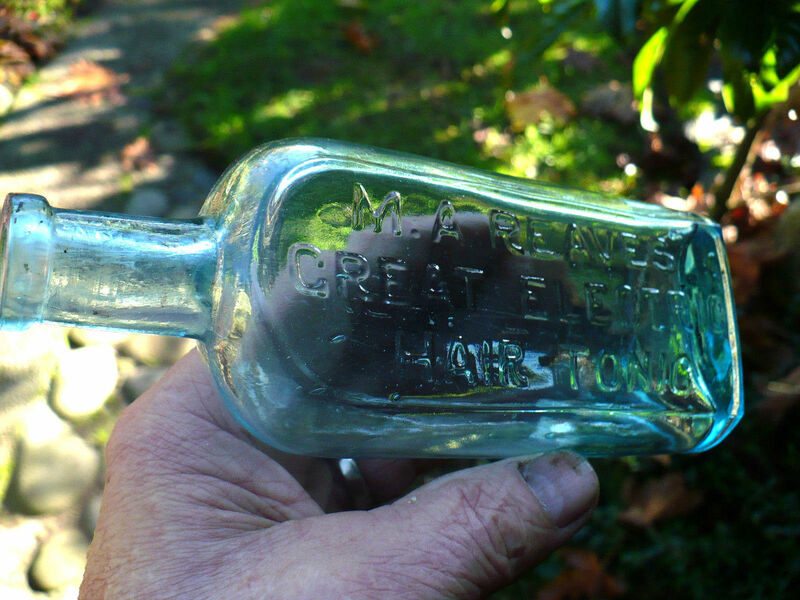 Here is a bottle I dug a few years ago. Any info would be helpful. Any others out there? 70s or 80s. I pulled the trigger a little too soon on the background of Mary Ann Reaves, so I will set the record straight. Her maiden name was Mary Angeline Skinner, born about 1829 in Illinois. She married Tennessee born George Reaves on May 27, 1847, in Madison County, Illinois. The couple made their way to Oregon Territory by the early 1850's where two sons were born, Samuel Irving Reaves in 1853 and Milton Franklin Reaves in 1854. The family then moved to Cottonwood, Yolo County, California, by the late 1850's where their youngest son was born in 1859. The 1880 census finds the family in Snelling, Merced County, however George is missing as Mary Ann is noted as divorced. 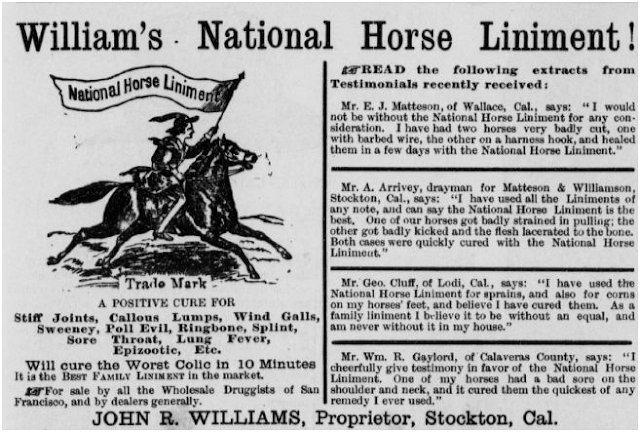 As noted in my previous comment, Mary Ann received a U.S. Patent in 1880for what she calls a "compound for catarrh." It consisted of an infusion of tobacco and wild mallard leaves (not sure what this is). But, the interesting twist to this concoction is, as the patent states, "When it is to be used for the ordinary treatment or dressing of the scalp the proportion of mallard-leaves is two ounces to twelve of the tobacco." So the invention serves a dual purpose depending upon the formulaic percentages. his would explain her note in her first advertisement where she claims her hair preparation is patented. 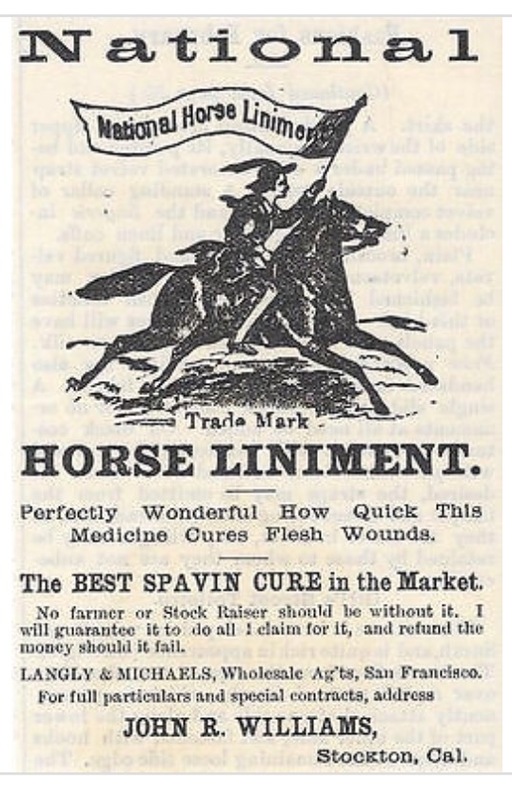 The first advertisement for M.A. 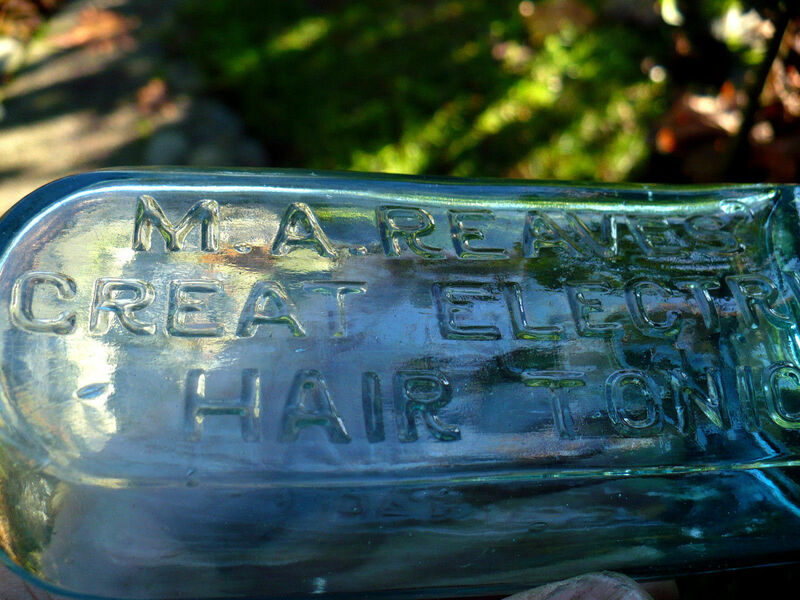 Reaves' Great Electric Hair Tonic. 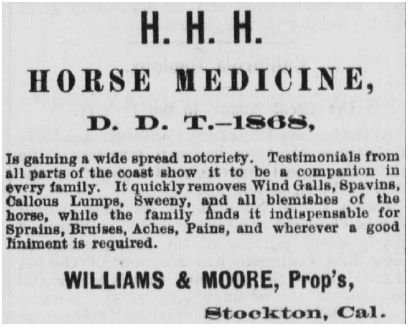 It appeared in the 1882 San Francisco Directory for 1882. Also of importance in assuring that the Mary Ann Reaves is the same one that produced this product, as well as the one documented with the family listed above is that for the first few years of her operation, her agent and salesman is listed in the directory as well, being Samuel I. Reaves. As noted earlier, Mary Ann continued to be listed as purveyor of her hair tonic until 1886, after which she is absent from San Francisco. Her son, Samuel I. Reaves, died in Los Angeles on May 9, 1921. I recently purchased a western hair bottle on ebay from one of our fellow collectors in Washington. Actually, I don't positively know its western as I cannot find any information on this bottle but those magic western style R's embossed in the glass are a pretty good indication that the bottle was blown in the west. I have seen another example of this bottle at the Anderson show several years ago but haven't seen any other examples since then. The flat front panel and curved back panel are, I believe, somewhat unusual for a western bottle. If anyone has any information on this bottle or M.A. Reaves I would appreciate your comments. Here are my rough guesses on the number of known examples of Western Bitters. I may be way off on many of these numbers and colors so please comment and add your knowledge. It would be great to further break down the numbers by color and variant. M. Keller - less than 10, green, amber, teal ??? Has anyone ever found pieces of puce Renz's, Boerhaaves, Alex Von Humbodlts, or Lyons?? Here is great bottle that was almost in one piece. What a shame ! How many busted blue examples have been seen over the years ? 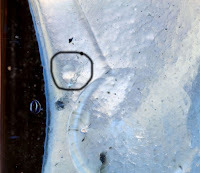 In a recent post I touched upon the use of mold forensics to make certain determinations or judgments about the bottles they produced. Such observations may be of little value to the increasing bank of knowledge about old bottles, but we often don't know what sort of importance can be assigned these discoveries until much later. Noted below are two examples that are currently of little importance but add to our collective knowledge. A plethora of molds with peened-out lettering attest to their reuse for other products or perhaps they experienced modifications by the original owner. 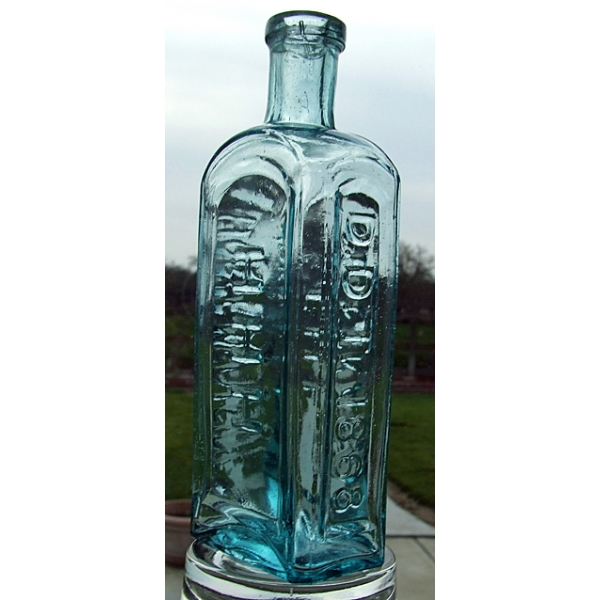 A privately owned mold would probably be stored at the glass factory where it was used to blow more bottles upon request from the owner. When a mold owner had no more use for his mold it would likely pass through the hands of the glass factory where it was modified for reuse. It may have been dismantled, with some parts being modified to fit other mold parts, and/or it may have been re-lettered and sold to yet another entrepreneur who had dreams of becoming another Dr. Kilmer, or Jack Daniel. The manufacture of bottle molds was an expensive commodity just as it is today so cost-cutting can be reflected in the reuse of outdated molds. 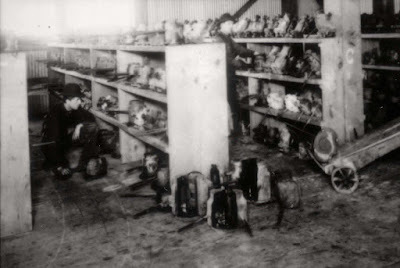 Photo of a portion of the bottle mold inventory at the Pacific Coast Glass Works in San Francisco in the early 1900’s. Note that each rack is alphabetically lettered. Shown here are Racks A, B and C. The company must have had many hundreds of molds in inventory. One of my favorite “mold conundrums” occurs on two separate soda water bottles and takes advantage of a uniquely placed bump on the base of each. 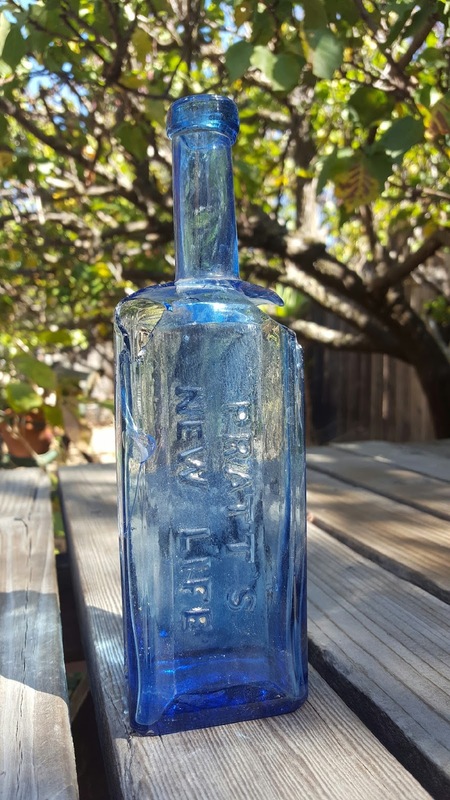 The lettered face of the mold for the SAN RAFAEL SODA WORKS experienced at least one modification when the single proprietor evolved into a partnership, and the bottles needed to reflect that change – probably about 1880. 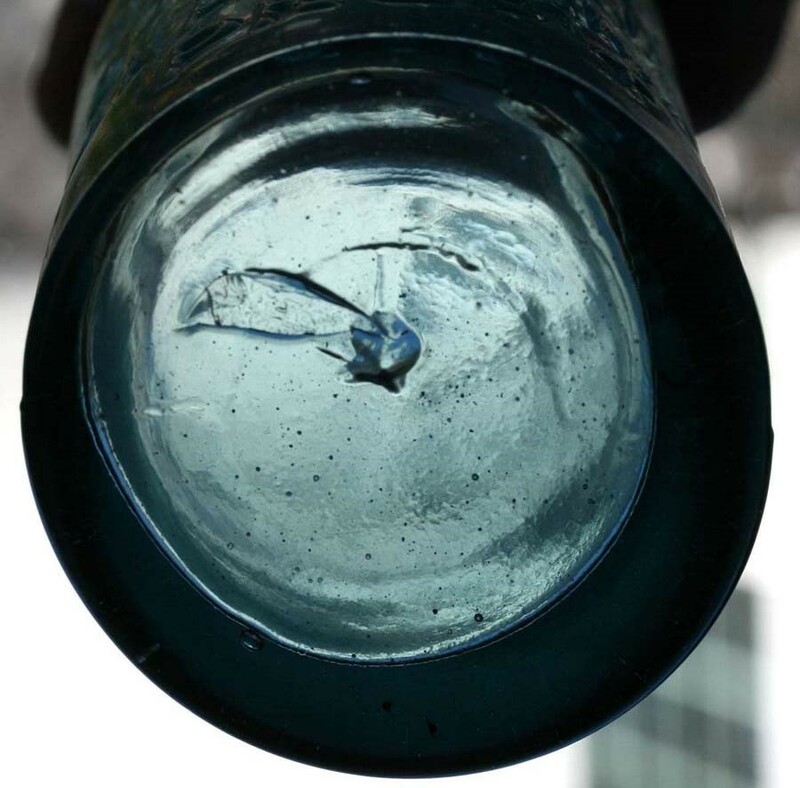 The bottle is also characterized by a small irregular bump that is slightly off-center. 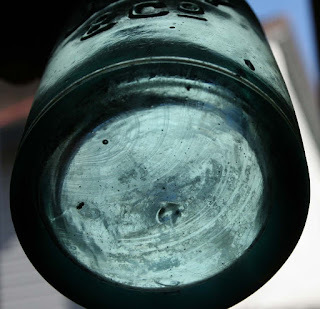 Having a good “selective memory” for things that are monetarily worthless, and historically trivial, I once studied the bottom of another soda bottle - from Salt Lake City, Utah. The J. DAY & CO. bottle has a bump on its bottom that seemed strangely familiar. I rummaged around in some boxes and retrieved my San Rafael Soda Works bottle for comparison. There is little doubt that the bases of these two soda bottles came from the same mold – or more precisely, part of the same mold. After staring at this discovery for awhile, I attempted to get past my “so what” conclusion. The relevance is rather trivial but I feel somewhat comfortable in attributing the J. Day bottles to a San Francisco glass company. It seems reasonable that after the construction of the intercontinental railroad the shipping of bottles eastward would have become more economical. Commerce to the east of San Francisco was generally more viable than shipping goods eastward over the continental divide, especially after construction of the railroad in 1869. 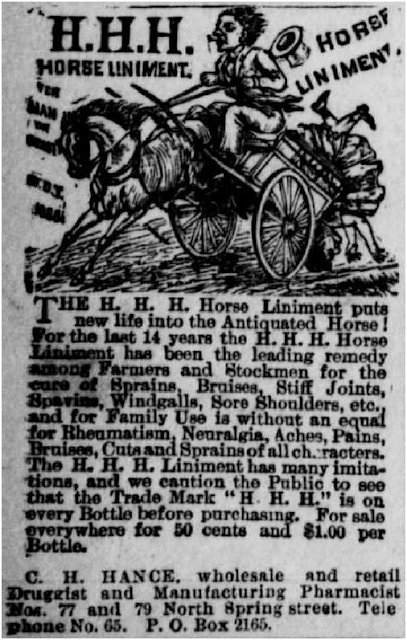 Having made that statement it must be qualified by further noting that there are many examples of bottles made in the East for the Utah market which appeared to be on the geographic dividing line, with said line probably shifting eastward or westward depending on market factors in play at the time. The San Rafael Soda Works bottle shown on the left was used for a very short period beginning in 1879. The mold was re-worked about a year later to reflect the initials of the new proprietors – P & B. Sylvain M. Provensal and Alphonse Bresson, two French immigrants, purchased the rights to the San Rafael Soda Works from Joseph Kappenman about 1880. . The photo below shows the base of the bottle with its rather odd off-center dot. Also visible is the keyed mold seam. The semi-circular key helped to align the two halves of the mold when they were closed. The J. Day & Co. soda water bottle was a first for Salt Lake City. None of the older Salt Lake soda water bottles that would follow it can be attributed to a San Francisco origin. 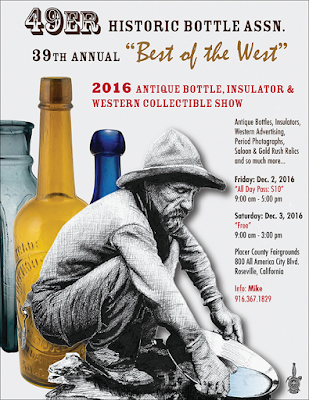 It was made in 1871 and the first to carry the little base dot that later shows up on the San Rafael Soda Works bottle. Unfortunately, the impression is not as clear as pictured here but it still retains its unusual form, which is similar to that on the previous picture, and is in exactly the same position within the base mold. After his wedding James Day had planned a “honeymoon” in San Francisco and boarded the train that same day with his new bride. (3) But, the trip was also for another purpose. Day had plans to open Salt Lake City’s first soda water manufactory that used bottles with his name embossed, and he would purchase the required equipment, and bottles, while he and his bride were in San Francisco. By May he was back in Salt Lake City and selling soda and sarsaparilla. Judging from his regular advertisements in the local newspaper he was doing a good business for nearly a year. On April 4, 1872, Day’s world took a decided turn for the worse when his young wife succumbed from complications of childbirth. (4) Just as Bishop Daniel Sylvester Tuttle presided over her marriage vows, he also spoke the obsequies at Rachel Day’s funeral. Bishop Tuttle was Episcopalian, which, I am sure, did not set well with her father, and implies a decided family rift for Rachel must have broken away from the Mormon Church. (5) It appears that James Day stopped selling soda water and focused on the sale of bottled porter and ale for a few months before closing up shop. Nothing more can be documented of James Day in Salt Lake City. 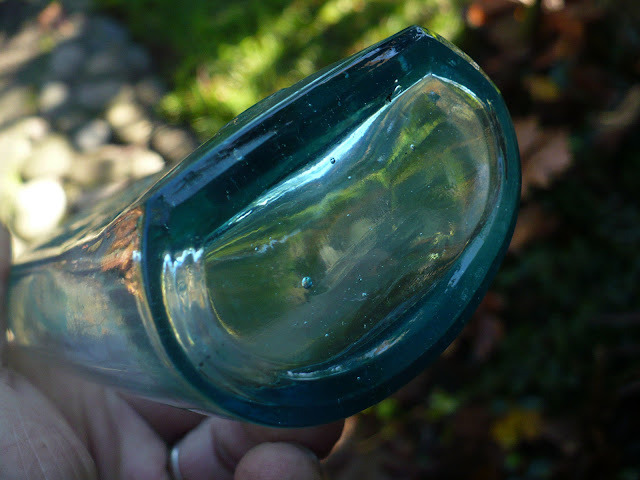 The DAY & CO. soda bottle mold probably sat in the inventory of the Pacific Glass Works for about seven years until it was reused by the San Francisco &Pacific Glass Works. 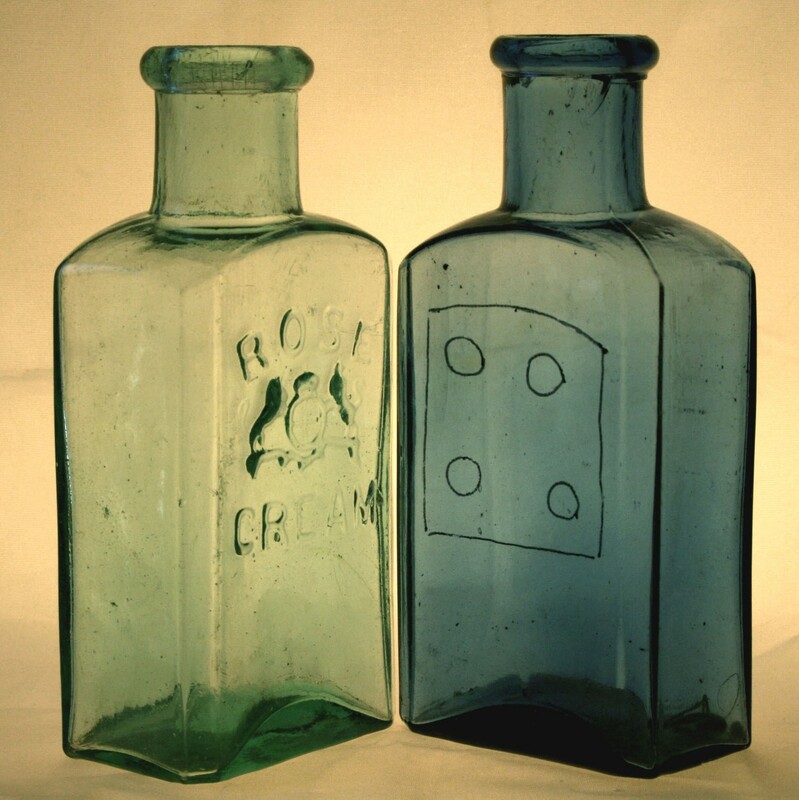 Joseph Kappenman requested a private mold for his SAN RAFAEL SODA WORKS bottles about 1879. The two halves of the DAY & CO. mold were then separated and the back half was used for the lettered front of the J. KAPPENMAN soda water bottle mold. This half included the odd dot on the base. Such is the sort of whimsical information that can come from the appearance of an irregular dot on the base of a soda bottle. The intrigue of another local bottle has also been enhanced by evidence of mold modification. The pictured ROSE CREAM bottle is rare by any account and appears to have been produced in San Francisco. The addition of the English Royal coat-of-arms does bring its origins into question except for the existence of another unembossed bottle. Both of the subject bottles are exactly the same shape and both were dug in California. obviously blown in the same mold. The blue unembossed version looks even more “western” than its embossed cousin. They both have applied tops, which, if blown in San Francisco, would date them to before circa 1880. They are 5 ¼ inches high. 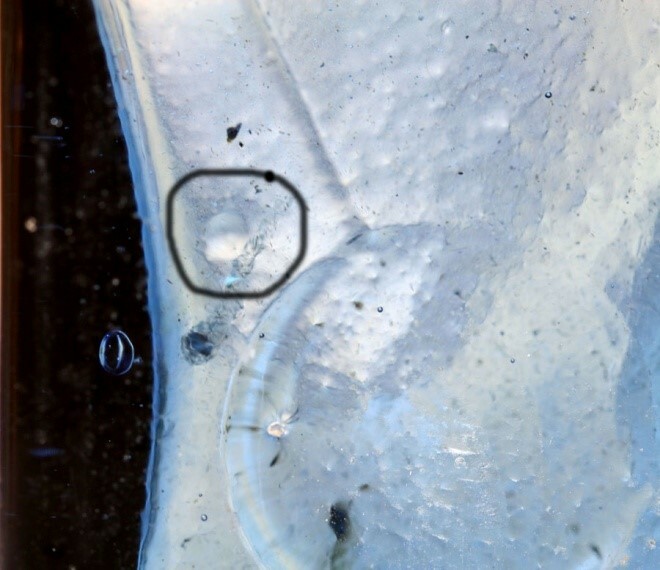 Upon close inspection, one face of the unembossed blue bottle shows faint lines of a slug plate in the mold and four rivet marks that held the plate in place. The size of the plate happens to fit very nicely around the area of the embossed features of the ROSE CREAM bottle. The embossing in the mold that made the aqua specimen was removed in order to make the un-embossed blue bottle pictured on the right. Upon closer inspection, the bases of both bottles reveal a small bump in the same location. This obviously unintended feature is positive proof that both bottles were blown in the same mold, with the ROSE CREAM bottle being blown prior to its unembossed relative. This is another example of a re-used mold. 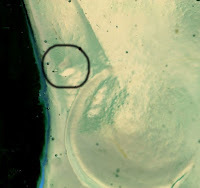 The small dot on both examples of these bottles are circled in the photos. They are placed in exactly the same location which leaves no doubt that both were blown in the same mold. The Rose Cream product must have been really short-lived as no information has surfaced about its manufacture. 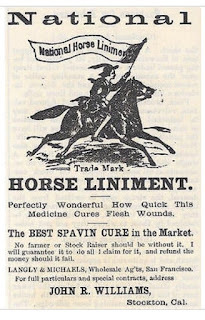 It was likely a cosmetic in the same genre as Wakelee’s Cameline, and Dickey’s Creme de Lis. Face whitening liquids with flowery names were all the rage in the Victorian Era. The examples of mold uniqueness cited here are not unusual. Most bottle molds have some individual characteristics that are transferred to the bottles produced. However, in most cases it just doesn’t matter – not even to the most obsessed collector or researcher. But, as collecting becomes more refined, the individual nature of such features becomes more important. Perhaps the greatest relevance will occur in the future as values of some bottles increase, enticing unscrupulous individuals to copy the originals and sell them as the real thing. 5. see Reminiscences of a Missionary Bishop by Daniel Sylvester Tuttle. 1906, for an interesting account of his life. It has been digitized by Google Books. Very excited to add this " OGW " Oakland Glass Works demijohn to the collection, acquired today in Tulare, CA.